“Update from Foster Mom: Attached are pictures of Riley in his foster home and some with his foster brother Jake. Of course Riley is still doing great. He is actually starting to play with Daisy, his foster sister. Of course Riley is still “hunting” cats in my house. He does go up the stairs on our deck to get back in the house from being outside. Even though he is blind he has learned that once he is up on the deck he know to go straight foward to the sliding glass door. 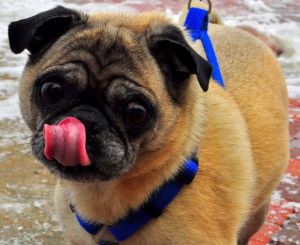 Being blind or diabetic has not slowed down this pug at all. I can cetainly tell that he feels a lot better since he has been in the care of Pug Partners. Riley is also one of the most cuddly loving dogs that I have met besides my own pug.